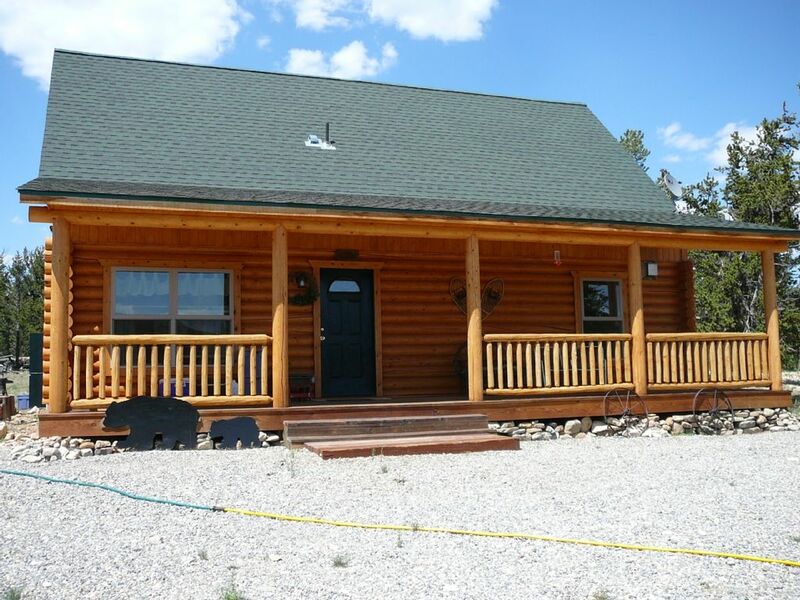 This is a great log home in a beautiful location. Located 4 miles south of Fairplay in a gated community, Warm Springs Ranch, that borders National Forest land. This property is a Convenant Controlled Community which is a Gated Community. Due to drought conditions in the West, Fires Will Not Be Permitted. You are liable to see elk, antelope, deer just outside the entrance to this area. At night, the stars seem to jump out at you and views of beautiful mountains abound. The changing seasons brings surprises of beautiful aspen and great snow, while you are cozy in the cabin with a welcoming propane stove and all the amenities of home. All roads are well maintained but four wheel drive is recommended in the winter months. Skiing in major ski areas can be found at Breckenridge (29 miles), Keystone, Arapahoe Basin, Copper Mountain, Monarch, Loveland and others. The area also has a tennis court and club house with games and a ping pong table. There is some thing for everyone and stocked fishing ponds located within the subdivision. The cabin has 2 bedrooms - one rather large loft concept upstairs and one downstairs both with baths. Main floor has the kitchen/dining and living area with plenty of natural light. Lovely front porch which allows one to sit on and admire the scenery or eat outside on a large wooden picnic table. Retired couple who has loved the mountains forever. This is our second mountain home in over 20 years. We love sharing this special place. This is all about relaxing and enjoying nature. We love to fish and hike and find that a great part of the experience. This property is unique due to the location. It is located outside a small ranching community. If you want T shirt shops and lots of restaurants, this might not work for you. BUT if you want to reconnect with nature, this is where you should be. Close to many 14,000 feet peaks to climb or hike, bike and unwind. I think the best part of our cabin and where it is located is the scenery. It feels rustic until you come inside. We think it is so warm and welcoming. I love our beautiful window that lets so much light into the cabin. We hope you will agree as many have already done so. Offered only in Clubhouse. Clubhouse very close to cabin. Charming and sitting in far more beautiful surroundings than the photos reflect. Lots of little touches to make us feel at home and taken care of. Thanks so much! These guests were wonderful. They left the cabin in great shape. We love guest who ask questions before their stay. So happy that they enjoyed their stay at our cabin. Thanks for the lovely review. You are welcome to come back anytime. This family was one of the best enters ever. Loved that they alerted us when they arrived and also after they left. We had an open dialogue going on while they were there. They were fabulous. Thank you for the lovely review. Giving them a 5 PLUS. Awesome property, very clean. We enjoyed our stay. The beds were just a bit harder than we were used to, but overall we were very pleased. More relaxing than a motel. This family were great renters. They were great communicators. Left the cabin in beautiful shape. Hope they come back in the summer. We loved this cabin, and the owners go above and beyond to make your stay special. It was very clean, nicely decorated, private, and cozy. We had so much fun. It is only about 45 minutes to Buena Vista. I highly recommend this cabin! What a lovely write up from great renters. Thank you and you are welcome to come back anytime. Love your cabin, enjoyed out stay. Very quiet and peaceful, comfortable. Weather was awesome. These were dream renters. It was hard to tell if they even were there. I love it when renters leave it the way you request. My husband said he could not believe how nice they left it. They are welcome back anytime. Glad that they enjoyed their visit. The drive to Warm Springs is on Highway 285 - reachable from Denver, Colorado Springs and Summit County via Highway 9 over Hoosier Pass. Skiing, cross country and downhill, snow shoeing, ice skating, sledding, snowmobiling are just a few winter activities nearby. Summer time provides beautiful hikes and fishing on some of the finest reservoirs in the state - Antero, 11 Mile, Spinney, Tarryall - within a short drive. Buena Vista (30 miles) has river rafting as well as Hot Springs and twelve 14,000 peaks to climb. Hiking and mountain biking is right out your back door. Don't forget those stocked fish ponds located in the subdivision. No fishing license needed. For big game hunters, this area is in area unit 49, which has bear, elk, deer, and antelope. Amenities: Phone, Cable TV, VCR, Kitchen with microwave and dishwasher - all the comforts of home. All linens are included and washer/dryer is on site. Games and club house nearby as well as the tennis court.